It's been a long time since my last nail polish post! In all honesty I've been trying to clean up my stash and focus on quality polishes without all the harsh toxins. 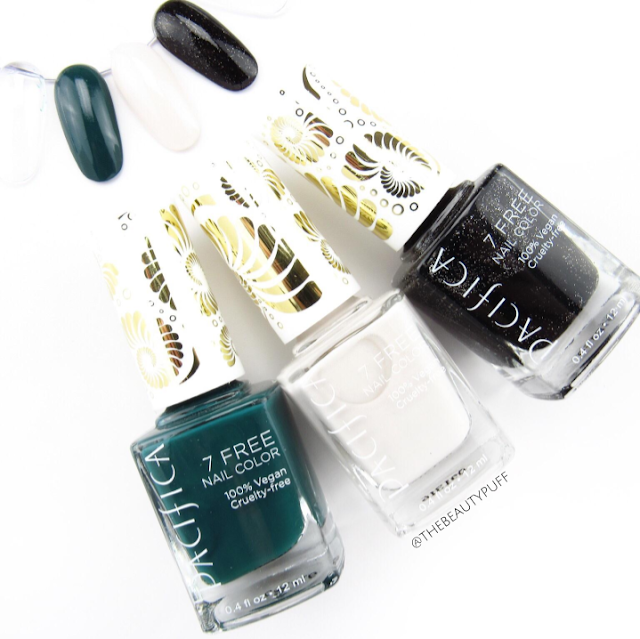 These new Pacifica nail colors happen to be 7 free. This means they are free of the seven most toxic chemicals that are commonly found in nail polish. They include: phthalates, toluene, parabens, camphor, formaldehyde, formaldehyde resin, triphenyl phosphate and xylene. Pacifica products are also vegan and cruelty-free! The nail trio I have is a gorgeous selection of cool shades perfect for the holiday season. These shades have a fabulous formula that doesn't streak and goes on opaque in two coats. Not only that, the shade range has a lot to offer. I gravitate toward the neutrals but there are so many vibrant shades in the line that you'll definitely find something to love. My favorite in this trio is definitely Wonderland. It is described as a pearled pink but on the nails it looks almost like a soft white with a hint of sparkle. It's an everyday shade with a little something extra. So pretty. These polishes retail for only $9 each and you can find them right at Ulta. At the time of this post, they are also on sale! Time to get all those stocking stuffers! Check out the entire color range below on Ulta.com. Happy holidays!